And, in an unsurprising move, it has been claimed by Miss K. I am glad to have it off the needles but will miss it's warmth as I rests on my knees whilst I knit in the evenings. 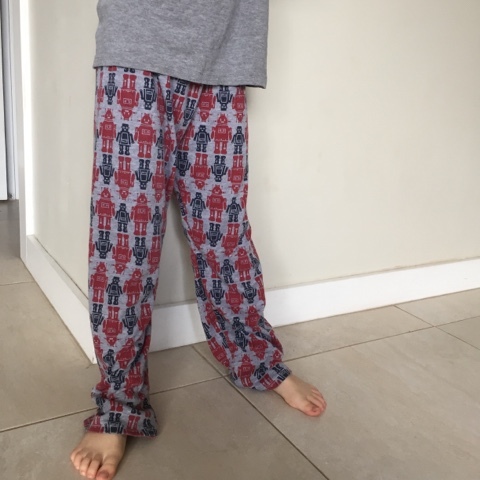 I've even dusted off the sewing machine and had a crack at making some Pajama bottoms for Mr F.
Perhaps unsurprisingly I also have a fabric stash and these robots have been waiting 7 years to be transform from a baby wrap. Pajama pattern please!!! I'm up for that. 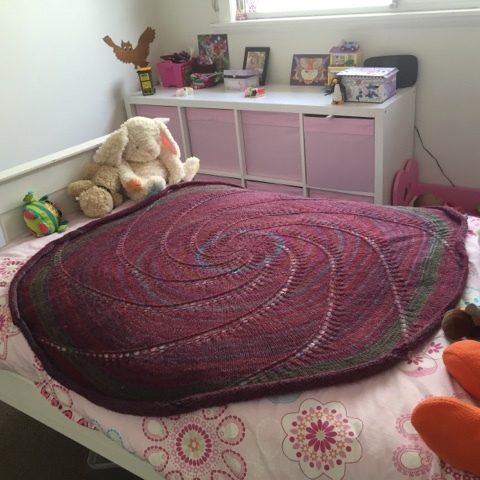 The blanket looks good on K's bed, that pattern does nice cushions too. The only difference was that I didn't do the band of exposed elastic at the top, I concealed mine.